Commentary: On the short list of figures from Episode I I never expected to see updated, Anakin Skywalker was on the top of the list. The 1999 release was perfectly fine, while he wasn't impressive there wasn't anything wrong with him and it wasn't like it was a figure I used a heck of a lot. This one is almost a total upgrade, and I only say "almost" because the 1999 release had a communicator and a cloak, while this version doesn't. However, this one does have an awesome new training lightsaber as well as the sadly all-too-uncommon Jedi Training remote, which still doesn't exist with a base tall enough for Luke Skywalker to use! Heck, Hasbro even made it for the 12-inch size, yet this is-- and correct me if I'm wrong-- the first real 3 3/4-inch remote after all these years. A lightsaber hilt was sized to fit his belt, and he also includes a Jedi training helmet, similar to the ones the 2003 Padawana of Ashla, Jempa, and Chian included. As gear goes, Hasbro did a nice job. Since Anakin is a short figure, it wasn't necessarily expected that Hasbro would give him the super-articulation treatment-- but they did, and it's great. There's a little cloth for his "skirt" piece the detail on the robes is quite impressive, and the boots look great, too. His hair color seems a little dark-- a common problem this year, Anakin's hair is frequently a little off-- but the face sculpt looks pretty great. While not necessarily a figure you were asking for, Hasbro did a great job with him. It's so odd to see that, in 2012, we're seeing "A" and "A+" efforts being made for characters that none of us were really sitting around demanding. With high prices, it's really important to see Hasbro execute figures in the best possible fashion, and while $10 is pretty expensive for a single figure, at least we're getting a lot of entirely new sculpts and those new sculpts aren't losing detail when they go from prototype to finished product. If we had figures like this in 1999, I think we'd all have died of shock. While I wouldn't consider him essential, if you're upgrading your old figures you're going to want him. Collector's Notes: You shouldn't have too much trouble finding him, either. He might dry up as the wave starts to go away as he didn't appear in subsequent assortments, but he's not popular so a tank of gas and an afternoon might help you get him-- failing that, order online or wait until he's cheap on eBay. Commentary: As we wind down-- I'm assuming we're winding down-- it's kind of interesting to see how some things are just a little less exciting. Genuinely new and different characters are rarer and rarer, so when we got a wave of 12 Phantom Menace figures it was nice to see that 3 of them were all-new characters and another 3 were significantly different takes on existing characters and troops to the point where it is, without question, a different figure. Queen Amidala is one of the latter, the obligatory new Natalie Portman figure that's different and new but you may or may not care. Back in 1999, ornate gowns were a novelty in this line and statistically, they still are. But what am I supposed to do? It's like I checked a box on a list. Yes, this outfit has never been made before and Hasbro was cool enough to add super-articulated arms on what is effectively a pepper shaker of a body, but that doesn't mean that there's fun to be had with this figure beyond her standing and gesturing. The sculpt is good. The head sculpt is one of the better Padme heads, and I appreciate the blaster. Heck, the gown is really nicely done with lots of nice texture and some great silver and gold paint bringing it to life. There's no question that this is a good figure, but unfortunately it leaves me feeling empty. "Now what?" I know there's a small group asking for all of Padme's gowns-- but after 17 years, the fanbase is big enough where there's at least a few dozen people excited to get pretty much everything. I'm not one of them. Even though the vast majority of TVC figures feel like new takes on things we already bought, they're still a lot more fun than Queen Amidala as toys go. Luke is loaded with fun gear, Lando has so much stuff it almost makes you forget he's supposed to be black. But the Queen? This is a figure that probably would have been about 20% more exciting as a non-Vintage release. The higher price point, reduced packaging footprint, and the lack of bonus gear associated with said smaller footprint just makes her a lot less exciting than a brand-new sculpt figure should be. Get her if you like the outfit-- it's a nice outfit-- but if you're at a point in your collecting career where you just know some figures are going to go on a shelf (or worse, in a box) after purchase you might just want to consider letting this one go and blowing $10 on another line. (Two words: Bot Shots.) No offense to the people who worked on this-- you people did and continue to do excellent work-- it's just that it's so hard to pretend to care that yet another salt shaker Natalie Portman figure is remotely interesting. The Peasant Disguise figure had way more going for it, and that's probably $4 or $5 at T.J. Maxx right now. Collector's Notes: You shouldn't have too much trouble finding her, and I'd almost suggest waiting for clearance here. The rest of the wave is pretty fun, this one is the biggest snooze of the batch. When the rest of the wave is packed with Jedi, Sith, and aliens, it's hard to compete though. No offense if you're a fan of this figure, either, it's just... eh. Boredom. The figure doesn't bring a lot new to the table, but it's good. It's a fine example of Hasbro exploiting its vast library of figure molds with a new head, giving you something that's worth picking up. 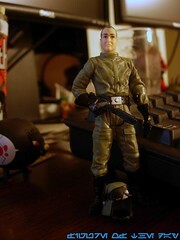 The figure has a thermal cap on under the helmet, so you won't see his hair, and the sculpt is pretty great. Sure, Hasbro probably could do an entirely new and amazing sculpt today, but I kind of hope they keep reusing the 2008 body to keep them consistent. Collector's Notes: This was a real "mileage may vary" figure. Some stores were loaded with him, and he was a pegwarmer. At other stores, he sold quickly. Fewer of him were produced than most of the other figures, so there really were more Dengars than there were Dacks. Despite being kind of a dud when he came out, he's now $20-$25 on eBay, which is, if you ask me, a bit of a surprise. I would have guessed $13 before I looked it up. The deco is quite good. The dome has a sort of gunmetal grey paint on it, with black panel markings. His various "facial" panels are red, as is the light under his bright black eye. A couple of lights to the side of the dome are blue, and the end result is a striking design which, as always, I'm happy to have. I don't know that this is an essential purchase-- the "Battle Over Endor" sets are some of the most obscure releases from Hasbro which still have a foot in the films-- but I'm crazy about Return of the Jedi stuff and any new droid I can get is going to make me happy. Collector's Notes: The sets came in early 2011 and had quite the range of prices-- at first, $24.99, but fans have reported them as much as $10 higher. Today the sets are about $20-$35, and if you can grab these sets for $20 you should consider yourself fortunate. I mean, a box of pilots and a robot for $20? How can you go wrong? Commentary: Happy 35th birthday, Star Wars! Let's celebrate with a look at the very first modern R2-D2, which set off a lot of confusion in the ranks of fans, being one of the first modern figures to upset our perceptions of the films as shaped by Kenner's toys in the 1980s. You see, R2-D2 in 1978 was much shorter-- this larger toy is closer to the size in the movies, which was spoken of as some unspeakable sin back in 1995. How dare they change it! Well, in many respects, it's a lot better-- remember, the original R2-D2 toy had a sticker for body deco, a bizarre dome which doesn't look at all like the movie, and only two legs. Kenner incorporated the first-ever retractable R2-D2 central leg in the 3 3/4-inch line with this figure, plus the first-ever "light up" eye. While a nifty feature at the time, fans were quick to point out that this part of R2-D2 doesn't light up in the movies-- a bit of his face directly under it does, though, but Hasbro rarely designs it to light up. This R2-D2 also kicked off the modern tradition of R2-D2 figures continuing the trend of the vac-metal silver dome, which Kenner kept around for most release between 1978 to about 2008. While not quite as accurate as today's best R2-D2 figures, this figure was a huge leap forward in 1995. I mean, it'd have to be-- the body was sculpted, the stickers were gone, and the head sculpt actually looked a fair amount like R2-D2. Of course by today's standards, I'm sure you could show this figure to new fans and claim it was a Turkish bootleg and they'd believe you. But back then, when we hadn't seen a new Star Wars action figure in nearly ten years, this was a delightful, refreshing take on one of our best friends from childhood. 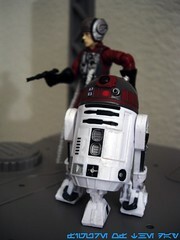 It is no longer an essential purchase since Hasbro cranked out nearly two dozen versions of the droid and counting. I still like it, though. 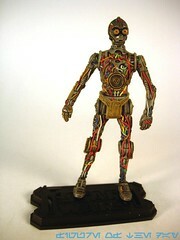 Collector's Notes: The 1995 versions of the Kenner Star Wars action figures are currently about as popular as the clap. You can get them for pretty much nothing, and you probably don't want them. Many figures from 1995-1997 are really worth a couple of dollars, and paying $5 may be too high. R2-D2 has the distinction of being one of the first "pegwarmers" in the line, particularly at Kay-Bee Toy Stores which actually imposed limits of 1 or 2 figures purchased per day per store. (Which reeks of communism.) This resulted in R2-D2 being left behind in large numbers, no doubt due to his smaller size and Kay-Bee's $6.99 (which was actually the SRP) price tag. R2-D2 began sitting at retail more often in 1996, and was usually joined by Chewbacca, Han Solo, and Darth Vader as the token "overproduced" figures. "Overproduced," of course, being collector slang for "any figure I see, have, and therefore don't want." Commentary: New figures in this line are increasingly uncommon since 2005, as new character introductions aren't quite as common in plastic. Thankfully Hasbro gave us an R4-F5 during the second big droid boom-- the first being when some lovable genius got some Astromech droid packs released in early 2006, and the second lasted from 2008-2009 as Hasbro really went hog wild with its build-a-droid line. As one of the many Walmart 2-packs released for the bargain price of $10, these sets transcended "just different enough to make you mad" even if you already had one of the figures in the set. At $10, with a new build-a-droid piece and at least one new or significantly different robot, how could you go wrong? R4-F5 builds on the vintage 2004 R2-D2 body with some glue and paint. The removable panel is fused in place, but the sensorscope mechanism still works when you rotate his dome around. All three legs have wheels, and the central one is removable. 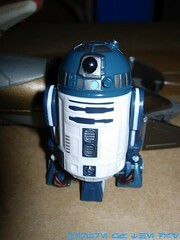 His deco is unique, similar to R2-D2 on the body but with paler blue markings, blue legs, and a blue dome. As his design wasn't really seen in full before the toy came out, it's possible Hasbro got to design some bits and pieces of him, and they did a great job. I mean, it looks cool. 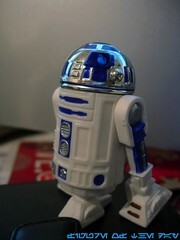 But I'm easy, I love R2-D2 repaints and this one, as a new robot, is particularly exciting to have. I love the entire wave, and would suggest you all look into it. Collector's Notes: On eBay, Star Wars fans are dumb. I may even be referring to you. Boxed samples of the figure are about $6-$10, which includes Plo-Koon and C-3PX' leg. Loose samples are usually $12-$17, minus the second figure and leg. So yeah, if you can't do simple math and realize more for less is better, you're kind of a dumbass. But when I say "dumbass" rest assured, it's with love. (And scorn.) Plo Koon has another astromech named R7-D4, which came out with the three animated Clone Wars waves which hit around August of 2011. Image: Adam Pawlus' former living room. Commentary: I'm somewhat surprised by the figures Hasbro selects for The Clone Wars line, as a Jedi with relatively little action like Shaak Ti gets made, yet the line is lacking in villains. This isn't meant as a complaint, I'm actually pretty stoked to see Hasbro keep some of the movie Jedi characters in circulation. Of course, it would be nice to see more of the original TV characters made into toys, but hey, whatevs. Shaak Ti turned out quite well and is one of few Jedi to be made without armor on her hands and wrists. Along with the likes of Luminara Unduli and Barriss Offee, she's a simplified version of the movie design. As animated Jedi go, she's actually quite remarkable in that she has a cloth "skirt" in addition to her outer robes, which actually seem to fit her quite well. Her hands are almost dainty, and her face is even more striking than the movie version. While not super-articulated, Hasbro did a good job capturing the necessary articulation for a Jedi with pretty much everything you could want except for ankles, and now that we're in 2012 it seems ankles are a luxury reserved for The Vintage Collection as the latest animated Rex didn't even have knees! 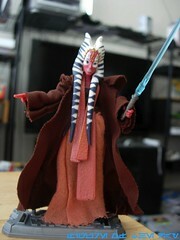 So in a way, Shaak Ti is an example of how they made figures in the good old days of about 20 months ago. Her lightsaber feels more sturdy and has a non-removable blue blade, and I dig that her right hand is in something of a "Force" gesture. This is one of those figures which should satisfy collector needs and-- if I may be so bold-- it should be just fine for kids, too. She can stand, she has a great range of movement, and she can hold her weapon... there's not much else you can ask for out of the Jedi tasked to train the clones on Kamino! Collector's Notes: While not super-common, she could be had in 2010 if you kept your eyes open. Today, she should be easily had for $6-$15. If you stumble on her for $10 or less, I'd say she's a worthy addition to any animated collection. Commentary: I'm starting with a note here: there are two very similar Clones released around the same time. One is this non-exclusive Stealth Ops Clone Trooper, the other is the Toys "R" Us exclusive Stealth Operations Clone Trooper released around the same time. The key differences: the name on the package, the non-exclusive version has way more gear, and the exclusive version has a distinctive black and yellow crest painted on his helmet. There are other differences, but those are the big ones, and that makes this pair of figures a fine "just different enough to make you mad" example. This release-- Ops-- has so much gear, it's unquestionably more fun and a better value. But the exclusive, Operations one? It's got a new helmet, and is essentially Commander Blackout. So the figures are indeed different, and this one is based on the 2010 "Stone" body. That means no ankle joints, plus the wrists and waist are swivel-only. The deco is cool, just like the clones on the Stealth Prototype Ship from the "not Das Boot" episode of the series. His helmet has a wraparound piece of communications equipment similar to that of Lobot, and I'm pretty sure it's only removable because Hasbro forgot to glue it. 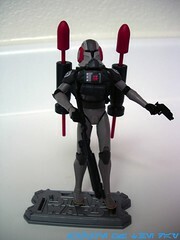 Commander Jet has a similar piece, but it's swappable for another array with a pair of antenna extended fully. This one, it doesn't have that. The biggest and weirdest addition to the figure is his backpack, which, since the figure doesn't have a peg hole in his back, connects to the breathing gear. The backpack is recycled from Kit Fisto, and the breathing gear is similar to that of the Space Trooper Clones. It even retains the nifty holster in the front, except this time all this extra gear is molded in a darker grey with some red highlights. It's fun. I'm not saying you should necessarily buy it, but if I had the chance to get more of this Clone I probably would. Hasbro hasn't done many black troopers for this line, and this definitely scratches that "close enough" itch to make it a worthwhile purchase. Collector's Notes: If you buy this figure on the secondary market, be wary of the aforementioned two similar-but-different clones. The packaging looks alike, the figures look alike, and many of the exclusive version was released sans the TRU sticker by accident. You might not even realize you bought the wrong one until it's too late! As always the price varies, ranging from $10-$20 on eBay with a few flukes below $10. If Hasbro reissued it today at $9 or so, I think you'd be happy with it. Collector's Notes: The set exists in a few variations, thanks to changes in Yoda's lightsaber (green or blue) and skin (light or dark). Mickey is, as far as I can tell, unchanged between them. The set sells for as little as $5 on eBay, but it generally goes for $10-$20. It's not worth $20. And yes, I have three versions of it, because I have an emptiness in my soul that's roughly the size of a 3 3/4-inch scale action figure. Commentary: So Hasbro's back for round 2 of Sev, which is a good idea because the first boxed set of the Republic Commando figures was scraping $100 before a new-for-2011 edition came out. It's better in some respects, and in others... not. This one has better articulation, excellent paint, and by most fan standards, is an unquestionable improvement over the original. The paint job is more modern, the red is darker, but it seems that the extra paint job and articulation has taken its toll, as an added clip-on piece for his right shin has been removed for this edition. You might want to make sure you have both versions just to cobble together an "ultimate" version of your own. By and large the set doesn't disappoint, but it's worth noting that this one cost about the same as the 2006 set, which had reduced articulation and two more figures than the 2011 release. Hasbro did a great job getting fans the improve shoulder joints, knee joints, and ankle joints they desired and without even having to wait for a sequel. This sort of thing proves there really is a market for Expanded Universe product still, and-- let's face it-- a lot of the product decisions we see about what does and doesn't get made really boils down to what Hasbro's current team feels like doing (and/or what the beancounters and management dictate.) People still want to buy stuff, even if it's similar to stuff they bought five years ago! Collector's Notes: The set was quite popular at Toys R Us stores in 2011, disappearing rather quickly from some stores. The set currently sells for $40-$60, so if you stumble on one at or below retail price you ought to get it before the price shoots up. Some Expanded Universe figures have a habit of getting expensive as video gamers have more money to spend on toys than toy people, it would seem, by virtue of there being fewer video game toys to buy. Commentary: The coloring of this Kit Fisto is actually more comic-like than his siblings. The green is flat, the eyes seem brown, and the general flare of the CG series just isn't here. The other animated Kit Fistos have more colorful skin, with the green fading from light to dark and to be honest, the detail of the facial sculpt does look better in molded green plastic than in plastic which is later painted green. Having said that, I still like the figure for what it is, a rare "Expanded Universe" entry to the TV show. Based on a pretty neat comic storyline, Plo Koon and Kit Fisto team up to fight walrus aliens with not-yet-Admiral Ozzel. Because it's cold, they get removable snow shoes, goggles, and all that stuff. 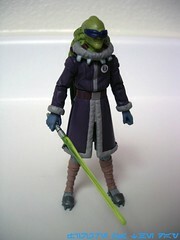 What's particularly interesting about this figure and the companion Snow Plo Koon is how they share a lot of parts. The torso, upper arms, and legs are basically the same with a new head, lower coat, and lower arms combined with paint creating a new and different figure. They shipped in different mixes, but all at the same basic time which meant that Hasbro really didn't exactly do great in the distribution realm for these guys. I did see them in the wild, but they went from having no figures in months to having 3 waves in a week, and those 3 waves just didn't quite get out there in all markets. (Although I did see them a few times, I guess I'm special.) Get this figure cheap if you can, since it's a comic-inspired one I wouldn't suggest going crazy for it. Collector's Notes: At $10ish on eBay, it's not a bad figure for the money. Plo Koon got repackaged in 2012, but not this guy. If you have the means, I'd suggest getting one before the price goes up. Image: Adam Pawlus' box for something or other. Commentary: I'm of two minds about Kaink, because while I'm delighted Hasbro gave us the relatively obscure Ewok priestess from the TV movie The Ewok Adventure, it's pretty half-assed. The figure is basically just a repaint of Keoulkeech (from the Marvel comic pack) with a new hat. That's it. It's a nice-looking Ewok in its own right, but as Kaink? I'm not buying it. I mean, OK, maybe she wasn't wearing the dress in the safety video, but c'mon man! It's not like you're going to do another Kaink! Why not get her costume right? She's a little too tall, and the paint job is a little too bright. There's a lot of white paint here, and she looks like she has a moustache. 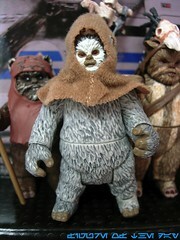 If this was meant to be some guy Ewok Hasbro made up, I'd say it was a neat, if weird, figure. I mean, Keoulkeech has smooshed ears, which seems pointless when you're making a figure who has a hat with ear holes. So, arch. The paint job on the body is good enough, as it's greying and clearly meant to be an older character. With none of her magical junk, or the right outfit, or a good face paint job, your main reason to buy this figure is to pick up another random Ewok. If you really want a Kaink, well, this doesn't count. I know someone at Hasbro is probably reading this and laughing-- rest assured, I'm smirking writing this, fully realizing I'm complaining that the obscure TV-movie Ewok from a crappy telefilm that's arguably worth never seeing is not up to my standards, well, eh. When it comes from 1980s-era Star Wars I know we probably won't get a lot of retreads, so I'm going to have to deal with it. At least Hasbro is making what seems to be a decent Kneesaa this year, and this set does have some redeeming points. I just would only suggest getting this if you want more Ewoks and you aren't particular if they're representative of anything. Collector's Notes: If memory serves, this set was abundant and possibly even marked down in late 2010. Today, the five-figure boxed set with Ree Yees, Chewbacca, the Star Tours Officer, Kaink, and the amazing Teek are selling for as little as $6. Even with $9 shipping, that's still insanely cheap. CLONE COMMANDER WOLFFE Plo's Bros! Image: Adam Pawlus' old toy room. Commentary: A mix of new and old parts! Commander Wolffe is made of bits and pieces from Commander Cody and Captain Rex with an all-new head and the second version of the Rex helmet mold-- it got redesigned for later releases of this kind of figure. It's pretty great, too! As the head of Plo Koon's divisions, more or less, he has grey accented armor which looks pretty good. I'm not going to lie to you, it's not super-exciting but the jagged edges do look striking compared to the simpler designs of other figures, plus the wolf (get it?) on the shoulder is cool. The main point of interest here is the head sculpt, which has a damaged right eye which looks far more disturbing and messed-up on the figure than it does on the show. His scowl is serious, as is his hair. That's not a crop of fuzz that's going to crack jokes. While you no doubt are not in the market for more clones, I like this one a lot. Wolffe doesn't get the same level of attention as the other major commanders, and he's more visually distinctive. I'd suggest getting him. Collector's Notes: A new Wolffe is probably out at a store near you by now, but this first release is nice too. You should have no problems getting him at or under ten bucks. He shipped in more than one case which helps keep his price down, and the new Phase II version will probably draw interest away from the 2011 release. Commentary: I don't normally like to come out and say things like "Boy, Hasbro missed the boat!" 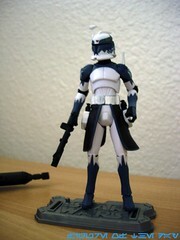 but in the case of this ARC Trooper figure, Hasbro missed the boat. Issued very briefly and in small numbers in 2010, the set came and went fast-- but was a recipe for success. It had Captain Rex, Fordo (close enough), and two new-style ARC Troopers. This is, without a doubt, the easiest money Hasbro could ever make-- it's mostly repaints and retools, and Hasbro opted to make it tough to get despite the fact that fans love ARC Troopers. Around the same time was a 4-pack of Mandalorians which Hasbro similarly short-shipped, because, well, I don't know why. "Hasbro is dumb" is really the only answer I got, because these could've been reissued, or tweaked and put into future assortments-- even if it meant reducing it to a 3-figure set, it's easy money. Older kids and collectors love cool armored dudes. When we first saw this set, a lot of us said "Oh, is this Colt?" and then we found out no, there's a Colt figure later, but this isn't it. The same mold would later be used for the popular (and expensive-ish) Colt, although Colt had more going on in the paint-and-accessories department. Still, this particular ARC Trooper has great dark red and silver detailing, swell holsters, and unique silver boots which I can't imagine are particularly practical in combat, but as I've never fought in stainless steel I really don't know. They look cool, though, and it's proof that Hasbro could probably make good money repainting ARC Troopers in awesome new paint jobs every few months. I'd buy 'em. They look great! The figure is super-articulated and its only real shortcoming is this was one of the first figures with ball-jointed ankles, but only swivel wrists. 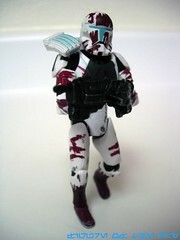 The mold is similar to the 2008 Clone Trooper body, but there were numerous modifications made to make it an ARC Trooper. I really do love the figure and the design, and it's really unfortunate Hasbro has made the figures based on this mold-- of which there are at least four-- somewhat tough to get. 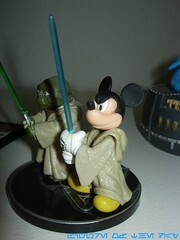 People will buy a gift set to get one of these guys, as the 2011 Hunt for Grievous set shows. Image: Adam Pawlus' kitchen, badly framed on a G.I. Joe insert. Hasbro did a great job engineering this figure, and a repaint of it would probably look even better. It's hardly an essential outfit, particularly when Anakin could probably use a better-looking figure based on his normal Jedi outfit from this movie. Still, I'm amazed they did it and it's a great upgrade from the 2002 figure if you hate the fun original. Oh, and he can sit pretty well, too. Collector's Notes: This wave sold surprisingly poorly, if the unlimited supply of it at T.J. Maxx/Marshalls stores is any indication earlier this year. You should have no problem getting one cheaply, and for five bucks it's a fantastic and amazing figure you shouldn't blink at buying. As we approach $10, let your taste guide you. Commentary: This AT-ST Driver was a great example of Hasbro exploiting its existing mold library when coming out with one of the best-ever exclusives for the price. The big boxed set included numerous repaints and a few new guys, but this was one of the highlights in the set. 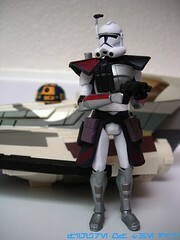 The head is a reuse of a 2002 Rebel Trooper, now with gray hair. The body is a repainted 2003 Han Solo (AT-ST disguise/Endor Strike) outfit, which itself was a retool of the 2001 Imperial Officer figure. The outfit was painted a little more green, given a little more detail, and presto-- instant "new mold" AT-ST Driver. (A Super-Articulated AT-ST Driver would be sold at Target in 2010.) This one is quite good and definitely meets the "good enough" criteria for an above-average vehicle driver figure. the sculpt may not be the most current, but he has no problems sitting plus has limited elbow articulation and a swell communicator sculpted right in to his hand. Some of you articulation fiends hate everything, but there's no denying this is a quality figure released, as a part of a boxed set, at an excellent price. Had Hasbro carded it, it probably would have sold fairly well. I'm actually somewhat surprised Hasbro hasn't cranked this one out for more gift sets. Collector's Notes: Similar-but-different AT-ST Drivers were included with the Ultimate Battle of Hoth set and Walmart's exclusive AT-ST. The Endor set, boxed, on eBay seems to go for as little as $60 and as high as $250. At $80 or less, it's well worth owning, even for just the exclusive Ewoks and the logs. Commentary: You might not be interested in reading about this Clone Trooper but rest assured, I'm not interested in writing about it, either. Based on the once-legendary perfect rock by which all future figures would be measured, this Entertainment Earth exclusive white trooper has some black spots on it to simulate battle damage. It's not what I had in mind when I pitched "battle damage" but you can't win 'em all. (Hasbro would go on to do excellent damage on several clones later in 2005.) He has a gun, is articulated nicely, and basically looks good. These sets are pretty cheap and the figures sit adequately, so your main reason for picking him up-- aside completeism-- is to use them as filler for your vehicles. You're going to need a few dozen clones for your AT-TE, and this is as good of a style as any. To date, these exclusive damaged clones have never been sold outside the exclusive multi-packs, but (of course) the white and ranking troopers have been released a few times by now. Collector's Notes: You should be able to get this set for about $30 on eBay, which I would argue is about right. I appreciate that an army-builder set took the then-best mold and mixed up the deco a bit, and I'd love to see some of that thought applied to Stormtroopers or other troops today. We've been getting too many plain white ones, and the same white ones at that, reissued time and again since what, 2008 or so? Just throw some mud on the figure and it's "new," Hasbro. We'll buy it. We're not that smart. Image: Adam Pawlus' old back yard. Commentary: We're at 1,800? Good lord. I was hoping to have some sort of book, or at least calendar, deal at this point but since I don't let's look at Exar Kun, one of the last comic pack figures to hit mass retail. While Darth Maul was the first double-bladed lightsaber to be rendered in plastic, Exar Kun's was one of the first seen in the entire saga when he debuted in the Tales of the Jedi comics, which took place a few thousand years prior to the movies. Back then, a story on the pre-history of the Jedi was refreshing and new, but now it seems every few years we're treated to a new period of time in the continuity full of characters we don't know nor do we care about. But I digress. Exar Kun here is modeled after a much older-looking character, as in the comics he had black hair for the most part and looked pretty young. He has a marking scratched into his forehead from the ancient Sith, plus scars from one of the duels with his former Jedi friends. The character is modeled after art from the Jedi Academy novels, where his spirit annoys and corrupts Luke's students in "modern times." 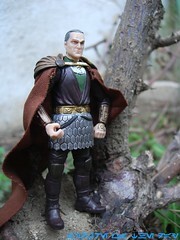 The figure is nicely articulated and has a great sculpt, but why is his hair grey? Other than wrinkles, there's only so much you can do to make a figure look old and hair is right there at the top of the list. I would just say this is a poor decision (or factory mistake) on Hasbro's part, because the figure is decorated well otherwise. He has lots of armor, and the cloth-meets-plastic cape hangs nicely and most important of all, actually looks good. Hasbro seems to have some difficulty getting capes right, so it's worth pointing out when they come up with a design that basically works. I'm particularly pleased with his belt and gauntlets, which feature more extensive coloring and some nifty detail. 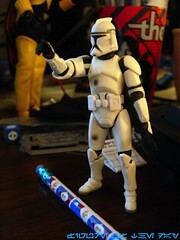 Oh, and his lightsabers are totally cool too. The super-articulated figure doesn't really have meaningful hip movement thanks to the design of his outfit, but what a design! It's not like it would have looked better had they rendered it in cloth, and there's little to no chance of most people buying Exar wanting to crack him open and sit him in a ship. So as he is, he looks pretty good, but I get the feeling customizers will enjoy him the most after they fix his hair. Collector's Notes: When I reviewed Ulic two years ago, I wrote this: "Part of the final wave of comic packs (and a recent release), odds are you can still have a shot at getting this one cheaply." I think the set was around $30 or less back then. Today? $100 as a start. Wow. See Hasbro, people are interested in new character figures! I saw this wave in stores a few times, so it's interesting to see something really shoot up in price this steeply. Commentary: Sometimes Hasbro can make an old figure look really great with just some paint, and this C-3PO is a heck of a nice upgrade from the 1999 original. This time around there are some gold elements which hint at what he'll look like in the future while several colors of wires are clearly visible and painted much more cleanly than before. Since the metal bits are now a matte grey plastic color instead of shiny silver paint, his guts really come to life unlike before. The 1999 head may be better with the lighter eyes resembling the movie better, but the 2012 one is just generally more colorful. Since he was a 1999 mold repainted for a quick and cheap exclusive, the figure has only 6 points of articulation and was designed without any thought to his needing to hold accessories. As such, what you see is basically what you'll get, and short of completely resculpting the figure there's not a lot you could do to make a better one at this point. The original 1999 sculpt really isn't bad, and while I'm sure Hasbro could do a better new one today I'm glad they put those resources on to new Pod Racers and other characters. If you have the old one you don't need the new one, but the coloring and wiring remind me a lot of some of the later single-carded Star Tours figures and he might look good hanging out with them. Collector's Notes: The Mos Espa Race Battle Pack didn't start hitting widely at Walmart until about early April, so he might be around at a store near you still. The set isn't bad, but don't buy it if you're looking for pilots for your Pod Racers. Do buy it if you just want some cool-looking figures to stand around or leave in the box. At $25 it's not exactly a bargain, but you do get about $28-$30 worth of figures. Even if all of those figures were sculpted over 10 years ago, the deco on all of them (even Sebulba) is different enough to warrant your attention. Commentary: In 2008 this Qui-Gon Jinn was the definitive version of the character, and today... well, it still is. The mold has been trotted out a few times since then, proving that Hasbro can probably make more money by making a figure right the first time and just re-cranking it out in new packaging, in new gift sets, or with new accessories. No doubt, the figure could be improved with a little more care in the paint. The moustache and beard are thick, blending in to one another, where it seems they don't quite merge in the same way in the movies. So really, Hasbro could get yet another use out of this figure just by painting the head better next time, although I'm a little sick of the mold after so many reissues. It's still fairly good, though, except it still includes a 1999-style lightsaber without the flared blade. At this point it's kind of inexcusable, but I digress. 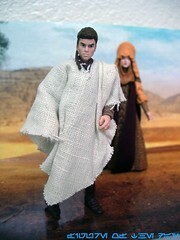 The tall Jedi includes a removable cloth cloak which, as usual, is big to the point of being annoying. But once you take it off, the sculpt is quite good. Hasbro put in some great detail in the boots and outfit, with the textures turning out quite well. 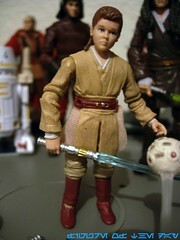 He has some cloth elements and like most Jedi has difficulty sitting, but a 2012 Battle Pack version aimed to fix that by returning to squared-off t-crotch joints. (At press time I don't have it and I'm quite eager to see how it turns out.) 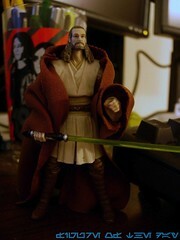 For now, this Qui-Gon is the one all collectors should chase down, although I might suggest fun-loving collectors get the Movie Heroes rerelease-- I'll review him with his gun in the future, but the vintage version or any of the other releases are, for now, basically just as good as the original Evolutions set. 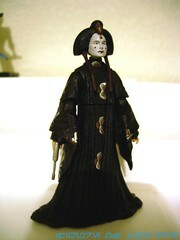 Collector's Notes: This figure has been reissued a few times. In 2009, it was part of a mail-in offer with an Eopie, but that release lacked with robes. In 2012, it was put out on a Vintage cardback as well as a Movie Heroes and Discover the Force package. The Movie Heroes one is notable for introducing a new firing gun, which is an odd accessory for a Jedi master. The Jedi Legacy Evolutions set is the version you really ought to buy since it includes a novel version of Luke Skywalker and the only movie Bultar Swan to date. The set can be had for as little as $15 before shipping, and it's totally worth it as all three figures are excellent. Commentary: One of the figures Hasbro can't quite seem to get right is Han Solo, mostly because the head sculpt seems to be tricky to get just right. For this release, Hasbro mixed parts from the 2004 Han Solo and the 2009 Han Solo to get one of the better bodies with one of the worse heads, and then slapped on a medal and called it a day. As a carded collectible, this vintage figure is low-level acceptable. The card art is nice, the presentation is good. As far as authenticity and value goes, this isn't a very good figure. In the movie, Han's shirt was buttoned up, and I admit it's a minor thing but in the era of Hasbro making new figures to reflect different belts I think getting the shirt right is a pretty important feature. The head is from the Death Star Escape figure, and is kind of big. 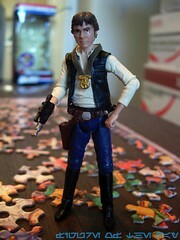 The 2004 Vintage Han Solo is one of my favorites, so I really don't understand why they changed its head for this release. Oh, one other thing I almost forgot-- the right thigh lacks the brown loop to represent where the holster is tied to his leg. For sitting purposes, I'm glad they left it off, it looks better as a toy this way. My last big complaint is value. Hasbro knows we'll buy pretty much anything on a vintage card and doesn't really concern themselves with keeping the price down-- it's a "premium" item, after all-- and doesn't worry about piece count either. This figure is very similar to figures previously released with Stormtrooper armor bits and bonus droid pieces, so we know Hasbro could probably have done better. With Saga Legends and Movie Heroes having included stands and bonus gear, it's just sort of unfortunate that Hasbro went for higher prices on the Vintage figures because they knew we would pay for it. If the product was a smidgen better, I'd gladly pay $10 or more, but I'd need some better sculpts plus some amazing accessories. If and when Vintage comes to an end, I'm expecting a return of environmental pieces or build-a-droid to keep fans interested, because a plain figure with a new medal accessory (of which we've had a few already) isn't exactly going to keep fans hanging around forever. Collector's Notes: The figure was somewhat common and made up one of the token "repaint" waves, although most of the figures had new tooling this time. You should be able to score one at or under retail price. 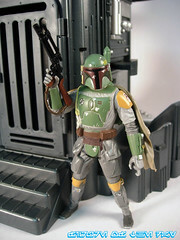 Commentary: If you like action figures-- and by that, I mean toys, with good sculpting and good paint, that look great and stand up without requiring a display stand, this Boba Fett is the first 100% newly-sculpted Boba Fett figure since, if my abacus is right, about 2008. It's also about as articulated as the figure from 1978, with some enhancements. It's not as covered in paint as the 2008 version, but it holds together a heck of a lot better and his backpack is difficult (if not impossible) to accidentally knock off his back. Toy lovers, this is the best Boba Fett toy you can probably buy. People wanting a $250 Medicom figure for $10... this isn't that. What this is, is the superior figure for your desk and/or kids. He'll stand around and not give you any guff. Let's get started with articulation as that's the one thing fans have been harping on. Boba does indeed have swivel jointed shoulders and hips, plus a ball-jointed neck with no removable helmet-- his helmet is his face, the way George Lucas ca. 1980 and Andy Mangels would probably have wanted it. The helmet has a fantastic range of movement and is pretty thick, which makes it feel sturdier than other figures based on the design. 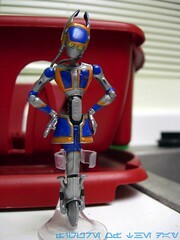 The arms swivel freely, exactly like the 1995 (or 1979) figure. The legs also have a good degree of movement, but the knees, ankles, and wrists are all gone. I know many of you are screaming bloody murder, but given how the tiny hose pieces restricted movement on the 2004 Vintage edition anyway, a new, clean sculpt relatively free of visible ball joints makes for a refreshing and interesting change of pace. He also has no problems standing-- many of my super-articulated figures tend to wobble if not posed just right, this Boba has no such problems. The sculpt seems pretty much perfect as an action figure. As its raw toyness goes, this figure is king, period. His level of deco is not as good as the 2008 version, which featured additional scuffing on the armor, helmet, and backpack. This new figure has plenty of silver damage, but the attempted level of grime on previous releases is hard to beat-- it looks a little over-the-top in some places, but it does have some oft-missing details like the gash in the right shoulder armor, albeit minus the silver "damage" paint. I realize it's kind of ridiculous to apply the standards of Gentle Giant or Sideshow's paint jobs to a $7ish action figure, but if Hasbro did do a version of this figure with a premium paint job I have no doubt it would be their finest Fett ever. Given that it's a 4-inch plastic man for kids to play with, it's really excellent in its own right, but it's not a perfect replica of a high-end figure at a low-end price because, frankly, that'd probably cost a lot more. His gear is better than anticipated. While it doesn't have the t-slot of the 1995 rocket pack, this one does have a good peg which actually fits into the back nicely and, so far, doesn't fall out. (A few of my figures derived from the 2004 Vintage sculpt pop out from time to time.) It's snug, and painted fairly well. His guns fit perfectly in either hand, although the smaller pistol sometimes falls out of its holster. (It could just be me.) The smaller gun looks gorgeous, painted silver and brown, and is arguably too good to be kept in the holster anyway. The rifle has a little bit of brown paint on it, bringing it to life nicely. 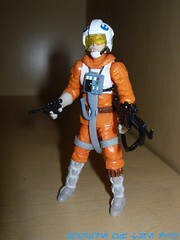 The figure could benefit from another quarter's worth of paint, and would probably be Hasbro's best Boba ever if given that kind of treatment. As it is, it's fun, and if you aren't hung up on every figure sporting 14 joints I think you'll enjoy this one. Future Points of Controversy: 1. I would love to see Hasbro remake all the original Kenner figures in this cheaper, 5-joint style. 2. This might be a rare item if Battle Packs distribution is like it usually is-- weak-- so consider buying it on sight. 3. I'd love to see Hasbro do a budget line of "vintage" figures using molds like these on vintage cardbacks at lower prices for Dollar Tree/Family Dollar/etc. stores (not 99 cent/$1 stores, but, uh, "dollar stores") like they've done with $5, 5-joint Iron Man, Spider-Man, and Captain America "Marvel Universe" figures as of late. 4. It is quite impossible for the figures to assume the poses shown on the back of the box. They're photoshopped above and beyond the norm, and are shown holding weapons with both hands or other things which are physically impossible. Commentary: I haven't been able to sneak off to see Star Tours since the grand opening, but my pal from work Shannon was kind enough to grab me Aly San San and the other sets from the launch last year. This is a fine example of Hasbro getting another squeeze out of its existing molds, which, when it comes to droids, I really like seeing them do. The figure is an acceptable one, carrying the best (and worse) of the original WA-7 release. The new deco feels like it stepped out of a theme park-- the orange and blue are nice and loud, and her yellow eyes look great in her steely frame. The wheel rotates awkwardly, which is why it's a good thing they included a display stand because it simply is not possible for the figure to stand on its own. Seriously, don't bother trying. You'd just be wasting your time. So, complaints? Yes. The wheel pops out easily, the right hand has a peg in it which is a vestigial remainder from the tray the original waitress robot carried, and the neck seems to be permanently looking down. Some cables on her back look cool, but give her the unfortunate proclivity for looking at the ground. Harumph. Still, she looks good and for those collecting the increasingly meaty Star Tours figure collection, you won't want to miss her. Collector's Notes: $40 is a lot of money to spend on a box of robots, particularly when the box has some figures you may rather not bother with. Aly San San, Ace, the Utai, and the Signal Droid are all pretty neat but premium pricing on theme park exclusives hurts. I wouldn't consider this set essential, as some people see Star Tours as existing outside the general Star Tours continuity. I'm all for counting it, but I won't lie to you and say that this is the brightest point in the set. It's OK. The original WA-7 has a cooler base and a tray, plus she works at a space diner. This makes her cooler. Aly is perfectly fine but is more of a fun souvenir than it is an awesome figure.